One of the principles at the heart of the Parent-Child Mother Goose program is that every session is led by two trained facilitators who share all teaching duties. With two facilitators, one can lead a particular part of the program, while the other observes and supports families’ participation. If need be, one facilitator can keep the group going while the other deals with individual needs. When appropriate, the observing facilitator can reflect aloud on what she has observed ("Sally really loves that rhyme — I could see her whole face light up when you did it with her Annie"), and this in turn can help parents become better attuned to their child’s likes and dislikes. As they observe the relationship between the two facilitators, families get to see a positive model of adults relating well together and sharing responsibilities. Because one facilitator has been observing at all times through a session, the two facilitators can reflect meaningfully after the session on everything that has happened, and these reflections can inform their planning for the next session. Having two facilitators contributes greatly to the fun and laid-back atmosphere of the program. It's worth underlining that these benefits occur regardless of whether the two facilitators concerned bring similar or complementary skills to their program. If we consider these benefits to be the "cake", as it were, that P-CMG's two-facilitator model serves to families, how much more happens in those situations when two facilitators just happen to bring complementary skills to their program? ​Someone with an interest in this question is Mandy Salisbury, an early childhood educator and research assistant in the field of Education who currently co-facilitates two Parent-Child Mother Goose programs in Melbourne as part of her role with Jesuit Social Services. Mandy's first Parent-Child Mother Goose groups comprised refugees, asylum seekers and migrants for whom English was typically an additional language. To support these parents, her agency employed facilitators who were either early childhood educators, like Mandy herself, or speech pathologists like her co-facilitator Kathryn Clements. Mandy describes her experience working with Kathryn as "fabulous". ​"We have complemented each other really well," Mandy says. "Kathryn is great at understanding that whilst a child's language delay may be the result of bilingualism, it is important also to look for ‘red flags’ of potential underlying issues. Kathryn has extensive experience working with parents of young children who have challenges such as oral language and speech delays, autism or developmental issues. This experience allows her to offer support and reassurance to young parents, and to offer them advice on how to approach their GP or other local specialists." ​Mandy's own skills as a classroom teacher and researcher have also been useful in these groups, she says. "As a teacher, I'm experienced in working with large groups, and I have a good understanding of how the English language works in context with other languages. My research background gives me the resources and knowledge to facilitate diverse groups with confidence. One issue I'm familiar with, for example, is the challenging but important matter of children maintaining their cultural identity by keeping up their home language while learning English as a second language." Mandy says she and Kathryn also work in complementary ways when speaking with parents after a session, although this is not necessarily because they come from different professional backgrounds. "Kathryn often finds herself engaged in small group talks that centre around parenting topics that come up, while I tend to get more involved more in one-to-one conversations around settlement or personal issues. I think we have just naturally gravitated towards the roles we're most comfortable in. Fortunately, our natural roles turn out to be well balanced." 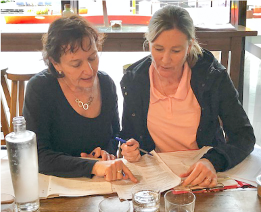 ​While co-facilitating has meant Mandy and Kathryn have brought complementary professional skills to their group, Mandy is keen to emphasise that what really matters most is that families should experience their Parent-Child Mother Goose sessions as happy occasions. "After each session, our volunteers and Kathryn and I typically de-brief over a coffee. When we do this, one of us often comments that our sessions are the time in the week when we feel most connected and relaxed, and when we have the greatest sense of fun and joy. It's true that in the group setting we are often doing subtle professional 'work' — but at the end of the day, that experience of shared joy is what it's all about." 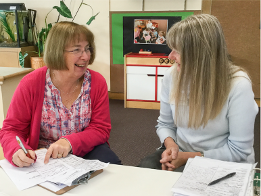 Marilyn and Jenny co-facilitate a Parent-Child Mother Goose program at Taralye Early Intervention service for deaf children and their families in Blackburn, Melbourne. Before retirement from full-time work, Marilyn was a teacher of the deaf, while Jenny was an occupational therapist with Uncle Bob's, a Royal Children’s Hospital early intervention centre. Because around 30% to 40% of babies born with hearing loss also have other developmental challenges, it's perhaps not surprising that Marilyn and Jenny find they are attuned to rather different aspects of the development of infants in their groups. ​"After teaching deaf children most of my life, I naturally tend to observe small, incremental steps in the ways babies and little children learn to listen through their hearing aids or cochlear implants and begin to develop their spoken language," says Marilyn. ​"Jenny, on the other hand, is much more aware of every child’s fine and gross motor development than I am." Marilyn says her and Jenny's complementary observations as co-facilitators feed directly into their session planning. Jenny Tuck (left) with Marilyn Dann. "Complementary observations feed directly into session planning". "When Jenny and I sit down together to plan for next week’s program, I can suggest songs or rhymes that will support a child’s development of long vowels, or which give emphasis to a particular consonant, or to words that are developmentally appropriate to that child’s emerging vocabulary." "Little children love hand and finger rhymes and songs like Incy, wincy, spider, Johnny, Johnny and Where is thumbkin? and are delighted to practise them over and over with their parents or caregivers at home. Families regularly tell us how helpful it is to learn ways they can assist their child within a joyous framework of singing songs and rhymes together, rather than treating these as must-do therapy exercises." For her part, Jenny says she has learnt a lot from working with Marilyn, especially in recognising the value of pausing before a "punch line" in a rhyme or song and waiting for the child to respond with a sound or action. "Given the time and opportunity," Jenny says, "a child may say "wake up" in Sleeping bunnies, or may prepare to "fall down the hole" in A smooth road, or start to clap hands in a clapping song. The child's anticipation of what comes next is a wonderful developmental achievement to point out to parents." Marilyn says children with additional challenges sometimes feel particularly frustrated making themselves understood, achieving new physical tasks or learning to regulate their own behaviour. "From working with Jenny, with her OT background, I've gained a much deeper appreciation of how songs and rhymes that focus on breathing can help to settle any child's anxiety and bring the tone down," Marilyn says. "A rhyme like Jeremiah blow the fire can work wonders here." "At the end of an upbeat bounce rhyme like Jelly on a plate, Jenny often has us take deep breaths in and out. You should try it yourself, and feel the serenity!" You can hear an audio version of the whole rhyme here.